The Philippines sees a better headroom to rev up its trucking industry as the world’s largest heavy machinery exporter, AA Japan, teamed up with local automotive trader and dealer Filanka Subic Corp. to open a $15-million facility in Subic. AA Japan executives led by president and chief executive Hameed Ramzan (second from left) and chief operating officer Kogawa Teruyuki (fourth from left) inaugurate the company’s facility in Subic Bay Freeport in partnership with local automotive trader and dealer Filanka Subic Corp. With them are Subic Bay Metropolitan Authority director Julius Escalona (left), Sto. Tomas Pampanga vice mayor Gloria Ronquillo, Vice Mayor of Sto. 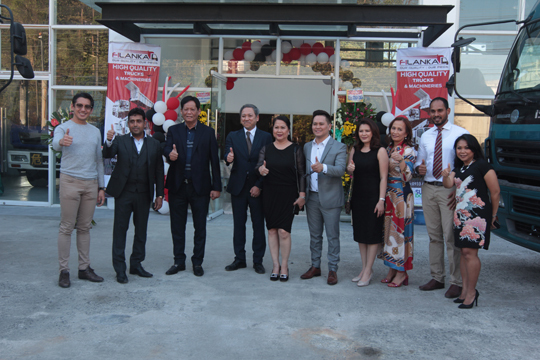 Tomas Pampanga (center), AA Japan sales executive Mayumi Tomori, Filanka Subic general manager Abdul Aseez and AA Japan marketing coordinator J.G. Estela Ishihara. AA Japan is the latest player in the local automotive industry to showcase its more than a decade-long reputation, offering a massive global network of partners and branches and a clientele of more than 10,000 customers. It is one of the biggest sources of reasonably priced and used heavy-duty vehicles, equipment and machines globally and is recognized as a leader in the used Japanese car market. “Every year, we deal with more than 10,000 customers throughout the world and our reputation of quality has never faltered. We strive, and we will always strive, to offer our customers quality vehicles at a low price, and to provide them with the best customer services,” said Hameed Ramzan, president and chief executive of AA Japan. The AA Japan and Filanka partnership offers a wide array of assets and services catering to the demands for high-quality, heavy-duty trucking solutions in the country. Targetting to advance the industry of used car segment, AA Japan and Filanka are also rolling out wider service offerings, including steering wheel conversion, reconditioning, repair, leasing, documentation and sales. The parties aim to advance the industry of used car segment and dominate the Philippine market. The partnership also aims to bolster the economic development in Subic, leveraging their proven track record and expertise. The project will also provide 200 jobs to local residents of Subic. Subic Bay Metropolitan Authority director Julius Escalona said during the inauguration ceremony that the partnership would provide local entrepreneurs with heavy equipment units and related services.